The fast travel system for PvP areas needs to be removed and placed into the hands of players. Allowing players to form and create networks of fast travel routes, charging what they wish for those routes, and allowing them to control those routes. Travel should cost more than just Albion Online silver, and should come with penalties. Owning Territory in X zone, and in Y Zone which is two away from X, should allow guilds, or alliances of guilds, to build some form of Teleportation / Fast travel building – upgrading it as another building. Making a whole new host of utility style buildings. Travelling should cost a specific type of resource between locations, and it should be possible for Guild to tax use of the system. Meaning they may open up said fast travel route to other guilds, or alliances… but it’s going to cost you whatever they damn well please.. and if you don’t like it. Build your own. Travel shouldn’t be from A all the way across the map to Z, it should happen in legs and jumps. Having a specific max Zone reach for each Teleport, meaning you must go A -> B -> C -> D, rather than a single teleport. 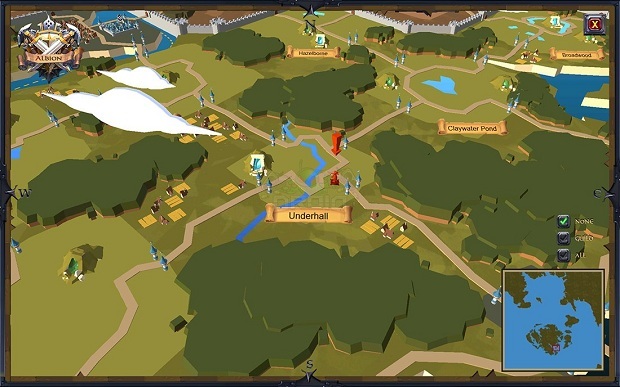 This means that if you’re travelling through zones, other groups will be able to not only jump you and intercept your troops, but it will also mean information on who is travelling where and along what route can be filtered to Alliances and Guilds; offering more information on who is where, allowing them to suit up and respond if necessary. To make the distinction between Red/Black and Green bigger and more defined. The further out you go the more hostile the land should become, not only in terms of PvP, but also in terms of the general content and Mobs you'll find within them. Yellow should, in theory, be not only the first stepping stones for people heading out into PvP, but also the demilitarized zone between the heavy conflicted areas of Red and Black, and the general safe harbors of green. If people are running their own fast travel network through Red Zones, they shouldn't then only be a single zone run through yellow to Green to sell whatever it is they have. There still need to be that risk, reward and grouping of travelling to stop any potential ganks from happening in Yellow from those who will most likely make a living from it. With Yellow being larger it'd be possible to play the inbetween bandit, especially with a reputation system. A sort of nomad who doesn't belong in green and refuses to make the step into Red, preying on the week and any easy supply runs from Red he can get his hands on. When Albion goes live, if the current Closed Beta numbers are anything to go by, people are going to be swarming those zones for their levelling (the type of situation we're seeing now) with a large zone buffer the bandit can live, thrive and have enough land to move between. If people introduced a Perm-Red right now for deaths in Yellow / Red, that limits that Characters choices to what is essentially the tiniest of tiny islands in terms of zones they can exist in. And we'll instead see even less PvP because of it. (No one wants to be limited to an even smaller area of an already small map), so you need to widen Yellow to make that choice to become "wanted" and "hunted" available, but still one that will have you hunted from both sides, Red and Green. Buy Albion Online Gold from AlbionMall.com, which is the best Albion Online products supplier.